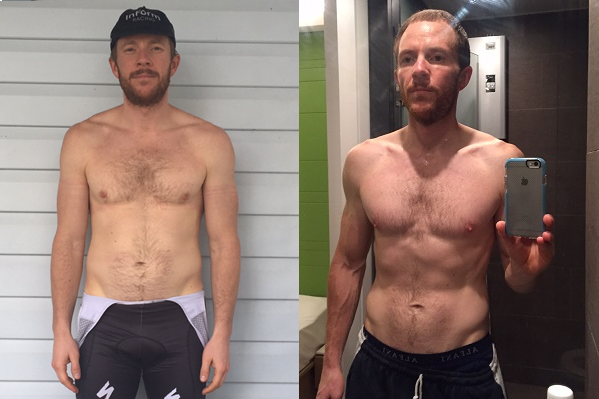 In preparation for one of Australia’s biggest amateur bikes races, the Tour of Bright, I recently dropped a significant amount of weight. During the race, which occurs over three stages, riders can gain significant time on competitors over two major hill climbs. One is Tawonga Gap, an eight kilometre climb, and the other is Mount Hotham, a beast of a climb that goes for over thirty kilometres and takes riders into high altitude. Therefore, if you want to be competitive and keep up with the bunch you need to be light! Weighing over eighty kilograms is really going to limit your chances of being at the front of the race, and in August this year I was nudging eighty-three kilograms. So in September 2015, while sporting what I like to call the winter body (as shown below), I got motivated. I was clearly carrying way too much weight to be competitive in the Tour of Bright and I needed to strip it back fast! Essentially I had ninety days to lose seven kilograms; roughly 12% of my entire body weight. Here’s what I did. At the start of 2013 I tried eating the Paleo diet for roughly six months. Whilst I eventually realised this wasn’t a suitable diet for someone participating in endurance sporting events, I did recognise it as being a great formula for losing weight. 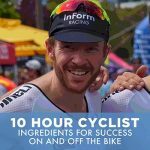 In my opinion, the biggest challenge with this type of diet – when you’re an endurance athlete – is lack of carbohydrate. I know there are multiple arguments out there stating that a high fat diet can actually be a more robust formula for athletes, as fats are ultimately a more efficient source of energy and our bodies were designed to burn this as a primary fuel source. However, I’ve certainly trained my body over the years to leverage carbohydrate as the primary source (I believe that goes for most of us) and at the age of thirty-five I’m not prepared to spend the time and effort required to wean my body into a different state of energy consumption. Importantly, I also love carbs! This is where the 80/20 rule comes in. Eighty percent of all my meals are based on natural eating and similar to Paleo, but I also allow myself to eat some rice and potato during these meals – two foods the Paleo experts consider too starchy for their liking. Breakfast normally includes fruits, seeds and nuts; lunch is a salad with some grains, nuts and light meat; and dinner could be veggies with some fish, avocado, more salad and perhaps some carbs, like rice or potato. I steer clear of anything processed. No breads, pasta, cereal, muesli, canned, packaged or takeaway foods. It’s clean eating all the way! 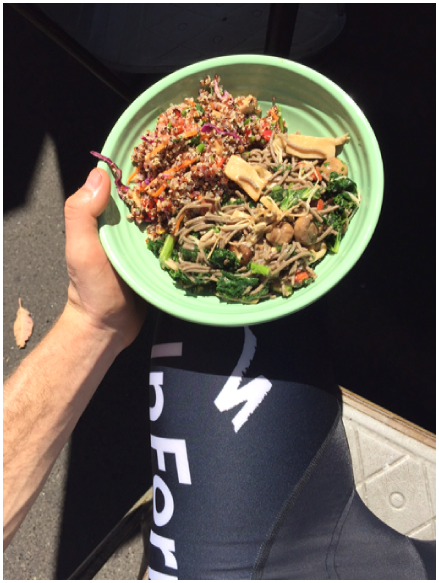 Resting a bowl of salad on my leg from my favourite salad place “The Food Smith” in Hampton, Victoria. Most people would eat three meals per day and potentially some snacking in-between. For me that means I get four meals per week – or twenty percent of my meals – where I can eat whatever I want. Obviously the goal is to lose weight so I don’t get silly here, but during one of these four meals I might go out for breakfast and eat some bread and include bacon in the meal. I might have pasta the evening before a big morning ride and always leave space for our traditional family pizza night on Fridays. The idea of these four meals is to not fully deprive yourself of foods you enjoy eating and to provide enough opportunity during the week to fulfill this need. This way you’re more likely to keep the momentum going and not fall back into old habits. I’ve created a rule that if I decide to eat something processed, like a biscuit or crisps for a snack, I lose one of my four meals that week. Therefore, I never eat anything outside of fruit, nuts or a cheeky bliss ball from my local health food store for a snack. Steer clear of all soft drinks, juices and anything with high fructose or sugar content. I drink two coffees a day (long blacks), herbal tea, water and a protein smoothie after each ride. When it comes to alcohol, I’m in the “bottle of wine a week plus a few beers on the weekend” category. Leading into the Tour of Bright, from early November, I completely stopped having wine during the week and really limited the amount of beers I had on a weekend – if any. If you’re like me, you get a little bit peckish after dinner and you end up snooping around the pantry or fridge looking for some form of after-dinner treat. Personally I’ve found dark chocolate to do the trick here. Dark chocolate is a lot lower in sugar levels and the bitterness from the Cocoa tends to suppress the appetite, mitigating further surges for dessert cravings. In other words, I will not end up eating a whole block, just a row or two. I created this 80/20 formula for myself as it allows me to still enjoy the foods I like whilst also enabling a pathway to losing weight, quickly. Interestingly, the longer you stay on this path the easier it gets. Perhaps you would’ve thought I’d be splurging on anything and everything following the Tour of Bright, but that has not been the case at all. The body evolves quickly and the tendency to reach for some veggies over a bowl of pasta actually grows. While this exact methodology may not work for you, consider this a framework you can personally use to come up with your own plan that will enable you to achieve your weight loss and cycling goals.